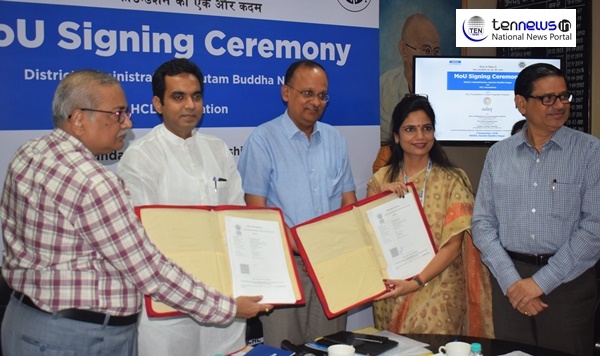 Noida: HCL Foundation, corporate social responsibility arm of HCL, has signed three Memorandums of Understanding with the District Administration of Gautam Budh Nagar (Noida). HCL Foundation and District Administration are working together to achieve the larger goal in the development of Noida. The three MoUs are signed for providing long term of Strengthing Public Health Facilities, Gender Equity and Self Effiency and to provide Early Childhood Care and Devolopment (ECCD). “MLA Pankaj Singh is Energetic and Enthusiastic. He always look forward for some positive development in Noida. We will give full cooperation for the smoothly process. Our MLA is very dynamic he keeps on working on various things for the development of Noida.